Boeing successfully demonstrated the HUMVEE-mounted Avenger Laser system last month, shooting down three Unmanned Aerial Vehicles (UAV). It's the first successful test of a vehicle-mounted laser unit. That's enough awesome for a lifetime. Boeing demonstrated the new Avenger Laser System at the White Sands Missile Range in New Mexico last month with impressive results. They were able to shoot down three small UAVs with the 1kW laser system and used the demonstration as a testbed for the U.S. Military. It was overseen by representatives of the U.S. Army's Cruise Missile Defense Systems project office. Small UAVs pose an increasing threat to U.S. troops in war zones based on their ability to carry ammunition and surveillance devices. The primary reason for using lasers in the battlefield is the stealth factor that they provide. Whereas missiles leave a smoke plume that can easily be seen for miles, a laser defense system leaves no trace, therefore the ground troops location will remain undetected. "Small UAVs armed with explosives or equipped with surveillance sensors are a growing threat on the battlefield," said Gary Fitzmire, vice president and program director of Boeing Directed Energy Systems. 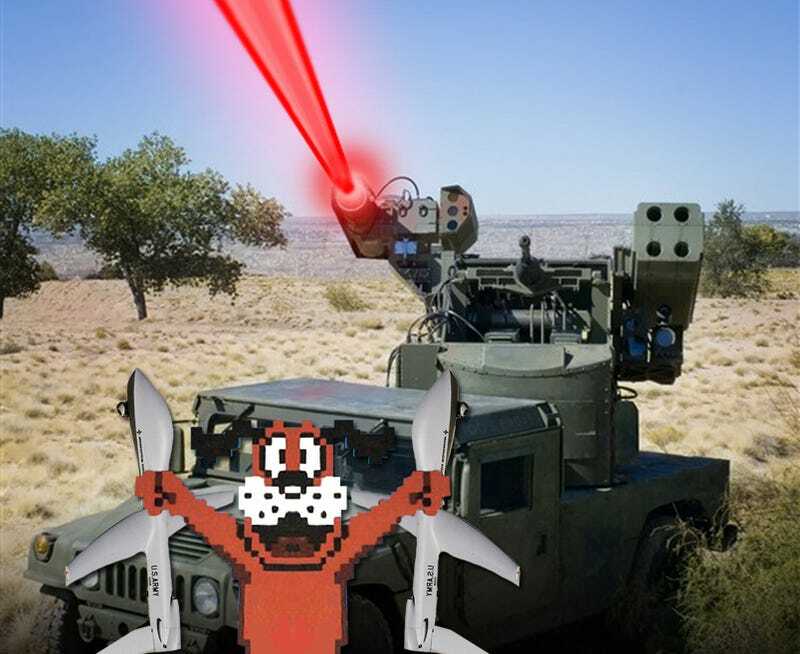 "Laser Avenger, unlike a conventional weapon, can fire its laser beam without creating missile exhaust or gun flashes that would reveal its position. As a result, Laser Avenger can neutralize these UAV threats while keeping our troops safe." This was the stuff of movies, comics and video games for years, but it looks as if it's finally starting to become a reality and we're excited. ALBUQUERQUE, N.M., Jan. 26, 2009 — The Boeing Company [NYSE: BA] has successfully demonstrated that a laser system mounted on an Avenger combat vehicle can shoot down a small unmanned aerial vehicle (UAV) like those that increasingly threaten U.S. troops deployed in war zones. During tests last month at White Sands Missile Range, N.M., Laser Avenger achieved its principal test objectives by using its advanced targeting system to acquire and track three small UAVs flying against a complex background of mountains and desert. The laser system also shot down one of the UAVs from an operationally relevant range. These tests mark the first time a combat vehicle has used a laser to shoot down a UAV. The tests follow a 2007 demonstration in which an earlier version of Laser Avenger neutralized improvised explosive devices (IEDs) and unexploded ordnance (UXO) on the ground. "We doubled the laser power; added sophisticated acquisition, tracking and pointing capability; and simplified and ruggedized the design," said Lee Gutheinz, Boeing program director for High-Energy Laser/Electro-Optical Systems. "Boeing developed and integrated these upgrades in less than a year, underscoring our ability to rapidly respond to warfighters' needs." Laser Avenger integrates a directed energy weapon together with the kinetic weapons on the proven Avenger air defense system developed by Boeing Combat Systems in Huntsville, Ala. It is a Boeing-funded initiative to demonstrate that directed energy weapons are maturing and are relevant to today's battlefield. Boeing leads the way in developing laser systems for a variety of U.S. Air Force and Army warfighter applications. These systems include the Airborne Laser, the Advanced Tactical Laser, the High Energy Laser Technology Demonstrator and the Tactical Relay Mirror System.